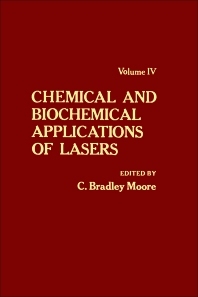 Chemical and Biochemical Applications of Lasers, Volume IV focuses on the practical applications of standard commercial laser systems. This book examines the structural studies of DNA by fluorescence microscopy and discusses photochemistry and structural spectroscopy. Organized into eight chapters, this volume starts with an overview of a few cases of laser-induced fluorescence studies of biological molecules. This text then examines the sharp fluorescence spectra of complex molecules in solids that are obtained when a narrow-band laser selectively excites molecules in particular sites. Other chapters describe the theory and application of resonance Raman spectroscopy to various biological systems. This book provides as well a thorough treatment of coherent anti-Stokes Raman spectroscopy and its application in combustion diagnostics and analytical chemistry. The final chapter explores laser control of the sequential photochemical reaction of the drug psoralen with the two strands of the DNA double helix. Physicists, chemists, electrochemists, and chemical engineers will find this book useful.